Ever since the Night King brought Viserion back from the dead with nothing but a touch, we knew that these two were going to make quite a team for the upcoming battle between the living and the dead. 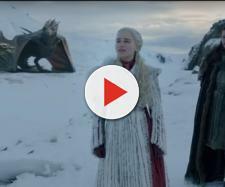 And in an epilog of what turned out to be a pretty solid season, we saw the dragon crashing down the part of the Wall with his blue flame and The Night King on his back. As a result, the whole army of the dead was able to cross the Wall, much to the dread of everyone in the Seven Kingdoms. Of course, it wouldn't be a "Game of Thrones" season finale episode if it didn't end on a cliffhanger. This time, the fans are left to wonder about the fates of our heroes from "Beyond the Wall" ranging party, Tormund Giantsbane and Beric Dondarrion. Hopefully one of them makes it out alive to inform the rest of the Night's Watch, mainly people at Castle Black, since they are obviously the next targets. And since Bran saw the whole thing by once again warging into the flock of ravens, he is definitely going to give the rest of the world a heads up. There's no doubt that this scene gave us a lot of talk about regarding "Game of Thrones" endgame, but there's one thing, in particular, we wanted to explain first. So without further ado let's jump straight into it. In one of our previous articles, we explained why we think Viserion is the White Walker dragon and not the wight. Now, we want to explain why the Night King and his dragon are more dangerous than you probably think. No matter what kind of a dragon you think Viserion is, there is no doubt that he and the Night King are now the most destructive force in the "Game of Thrones" universe. Right before Viserion was about to tear the part of the Wall down, you could see how fast he was approaching. So much so that it seemed as though he is the one with the Night King. This is not far from the truth as we already know that the Night King is controlling everyone in his army. But it's not just about the control; it's about the Night King literally being one with the dragon, by warging into him. And that further supports the theory that the Night King was a Stark before he was turned into what he is now by the Children of the Forest. With all of this being said, it seems as the Night King has been waiting his entire immortal life for a chance to warg a dragon so he could destroy human kind once it for all. And just by seeing the portion of what they are capable of together, the events from the "Beyond the Wall" are starting to make sense. What if the Night King knew that Daenerys will come to rescue Jon and his party? That would certainly explain the chains. And what about the question of all questions? What does the Night King want? Why did he choose to fight the human kind at this particular time? After this episode, it appears that we know the answer -- he was waiting for the dragon.